We invite you to join the many businesses that support the Door County Land Trust and become an Annual Business Member. 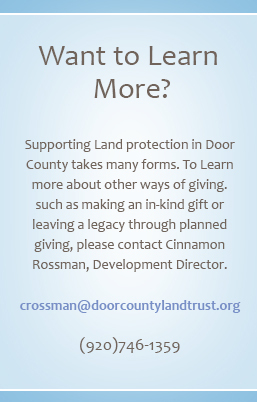 As a Land Trust business member, you will be demonstrating your commitment to making a lasting difference in your community. Land Trust supporters are loyal, engaged and committed to the preservation of land and they equate the Land Trust with quality. Many are summer residents and/or second home owners. Many are early retirees, successful and well-educated. Your support of the Land Trust would be appreciated by these donors – your current or potential customers. Your business will be recognized throughout the year in numerous Land Trust materials and at special events. Click here to see Business Member Benefit Levels: $350, $1,000, $2,500 and $5,000. We hope you will become a business partner of the Land Trust by completing the Business Membership Reply Form and returning it to the Land Trust with your annual membership contribution. Donate online at the level of your choice, and tell us this is a Business Membership in the special instructions note. Click here to see our current list of Business Members.